Marathon Tribute to My Papa (by Paradigm Runner) | JustRunLah! 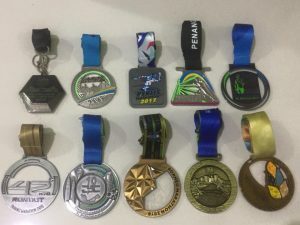 As my lethargic feet sprinted past the finishing line of Balik Pulau Marathon on 7th October 2018, a mixed feeling of joy and sadness overwhelmed me. Joy because I achieved my target of 10 marathon medals within 2 years, as well as another Sub4 Personal Best and Top 10 finishing. Sadness? Well…. there’s a reason for that. Someone once asked me “Why do you run marathons?” It was a simple, innocuous question, yet it set my memory rolling back almost three decades ago. This marathon goal has been a personal emotional journey for me. Perhaps this is a story begging to be told! The year was 1988 when I was only 17 years old. 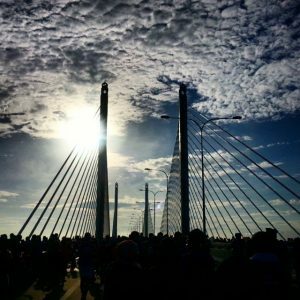 After a few successful short runs, I felt somehow brave enough to attempt Penang Bridge Run 21km, hence I asked my dad for permission to register for the event. Despite my lack of long-distance training, I assuredly told him that I should finish the race within 2 hours. Call it what you want – teenage bravado, youth hubris and exuberance. Yet my dad listened intently, but said nothing to burst my overinflated bubble of confidence. So on the event day, in the wee hours of the morning, my dad woke me up, got me ready for breakfast and then fetched me to the Start Point, which at that time was Universiti Sains Malaysia (USM). Once the run started, I rushed to the fore, full of energy and vigour. As I passed the half-way mark within 50 minutes, I was highly confident of achieving my goal. However the lack of practice began to take a toll on me & barely after Km12, I suffered severe cramps all over my legs. 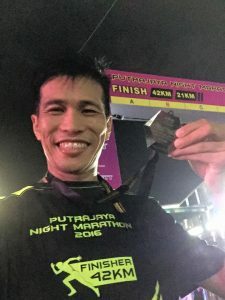 Despite my attempt to walk and run, I was forced to make my way back to USM half-limping, where my finishing time was expectedly well beyond 2 hours. With tail between my legs, I arrived home to inform dad that I failed to achieve my target. After listening to my tale of woe, he sat me down and looked me in the eyes. As a 17-year-old teenager, I guess, the disappointment of failure hit my confidence real hard. Ever since that incident, I didn’t run that often anymore. And though I still occasionally pounded the pavement during my university days, most of my attempts were limited to short distances, about 10-15km. Even when I summoned enough courage to try Half Marathon (HM), I usually finished beyond 2 hours. Of course, once I started my working life, spare time became a premium and I also found other new pastimes. My running interest was temporarily locked up in the vault of history. 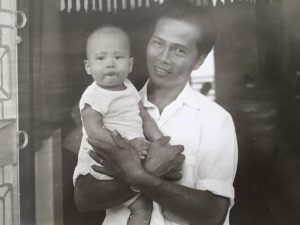 Fast forward to 27 years later – it was around late-2015 that my dad’s health gradually began to deteriorate, ever since he was discharged from hospital for an accident. Once a picture of strong healthy man, my beloved father became alarmingly frail and I was somehow alerted to his mortality. It suddenly dawned on me that I still had an unfulfilled promise. If I were to rekindle the fond memory of finishing my run, I must do it soon. I wanted him to know that he was the one, whose inspiration was behind my life and running interest. But this time, I stepped up the challenge, instead of HM, I would attempt Full Marathon (FM). Thus I set myself 3 goals – to run my first FM in 2016, achieve Sub4 FM by 2017 and complete 10 FMs by 2018. An action plan was immediately drawn up for 2016. To prepare for the marathon, I jogged averagely 3 times a week and began to join at least 1 run event almost every month. To bridge the gap between HM & FM, I participated in runs beyond 21km, just to condition my body for the rigorous distance. 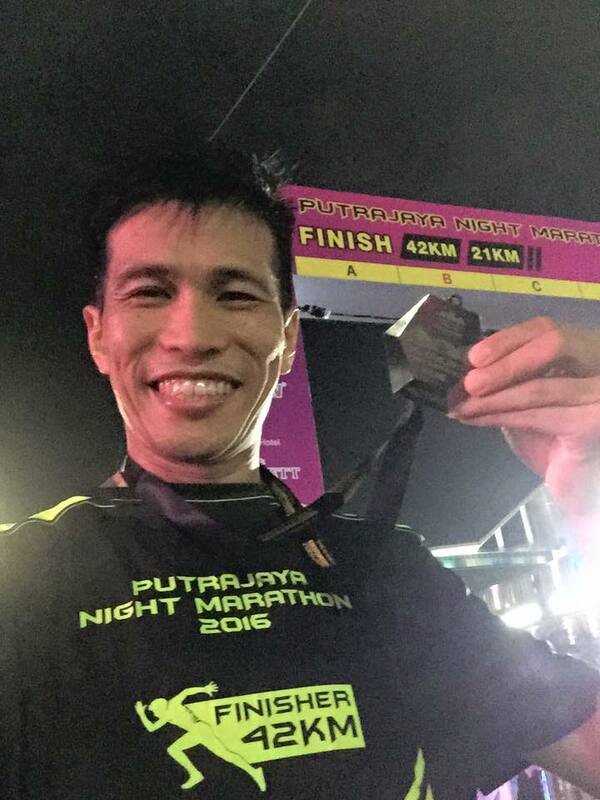 Putrajaya Night Marathon 2016 – my first full marathon! 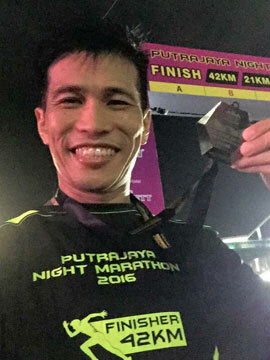 My first goal was achieved, when I completed my maiden FM (Putrajaya Night Marathon) in November 2016 with timing 4:25:22. My dad was the first person that I shared my medal with, as I regaled him with the stories of my first FM. I also committed to him that I would train hard and attempt my second goal (Sub4 finishing), most likely by mid-2017, during Standard Chartered KL Marathon (SCKLM17). That achievement would be the perfect gift for my dad, as well as a redeeming moment for myself since Penang Bridge Run. Sadly my father passed away, just about 2 weeks before SCKLM17. I was devastated. His demise took away the spring from my steps and I lost my will to continue training. After a week of serious thinking, I eventually strengthened my resolve to go for it. “Let’s achieve Sub4 in the memory of my father” I mouthed silently to myself. Come May 21, 2017, there I was, standing amidst thousands of marathoners at Dataran Merdeka and waiting for the flag-off of SCKLM17. There was a carnival-like atmosphere, with loud music playing and the event emcee cheering the runners before the start. I still remembered the morning breeze caressing my face – soft and cold, yet refreshing. Perhaps due to the lack of training during funeral, I felt a bit nervous, but somehow still determined to complete the race. Once the starting horn was blown, I again raced to the front & stuck to my planned pace. At an hour mark, my tracking device showed a run distance of 11.5km. After that, my speed slightly slackened when I clocked 22.6km after 2 hours, but I realized that this dream of Sub4 was still much alive, as long as I stayed within the current pace. The next 15km would be crucial, as I prayed hard that I didn’t hit the wall. Somehow soon I began to feel my thigh and calf stiffening – a symptom of impending cramps. “Stay focused” I muttered, as a Salt Stick pill was quickly swallowed to avert the pain. 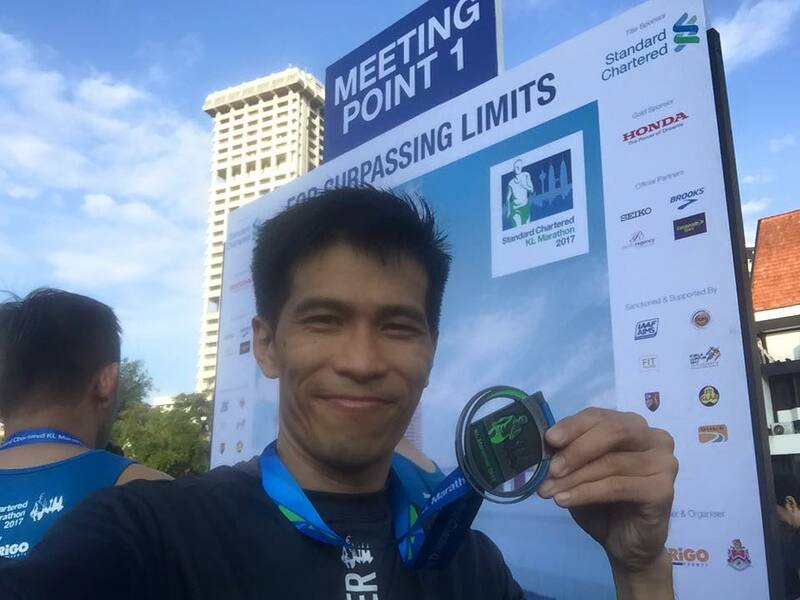 As Km30 marker appeared after 2:41:02, I knew that an average pace of 6 minutes per km for the last 12km should clinch it. However disaster suddenly struck! I felt a jolt of ‘electricity’ coursing through my right hamstring, promptly followed by a sharp pain – the much-dreaded cramp! I slowed down a bit to reduce the agony, fully aware that I must still keep the required pace. At first, the cramp dissipated, but as soon as I accelerated, the excruciating agony returned. As I hobbled to the nearest Aid Station, the sight of Red Crescent staff with anti-pain spray was such a relief. Precious seconds ticked away, while the medical personnel attended to my cramp, animatedly spraying both my legs. The next marker showed another 8km to go (which included the last hilly stretch), which I only had less than 50 minutes. Not much time, but sufficient, if only I can find a way to overcome the pain. “Mind over matter” was the usual mantra for runners. Right at this moment, the mental image of my father motivating me, 30 years ago re-appeared. “You can do it – believe in yourself”. The memory was somehow comforting, as well as invigorating. While the cramp momentarily diminished, I summoned the remnant of my energy to ascend the hill. In the last few kilometers, the pain struck again several times, but each time these happened, thankfully the soothing thought of my dad cheering me from heaven, managed to assuage the cramp and spur me towards completing the race. “Believe in yourself” I held on to his encouraging words, as I focused on planting one foot in front of the other. Finally my first Sub4 finishing! 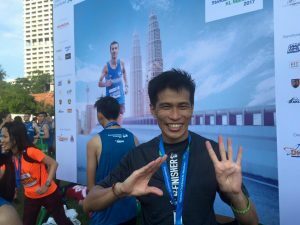 When I finally crossed SCKLM17 finishing line, I glanced up at the display clock! Time stood still for a while – 3:55:52! “Thank you for everything, papa!” I whispered softly, as I gazed skyward. In the embrace of my beloved papa! Congrats on the strong finishes! A well written article! Thank you for the inspiring story. Keep going.